The Crime Scene Investigations Team of the Rocklin Police Department handles the forensic investigation of crime scenes within the city of Rocklin. 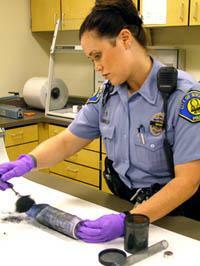 Trained Crime Scene Investigators process scenes for fingerprints, biological and trace evidence. Investigators conduct forensic photography, collect and book all evidence at scenes and testify in court on forensic aspects of criminal cases. Crime Scene Investigators are specially trained to handle the challenging aspects of forensic investigations in a variety of cases. Currently, the Crime Scene Investigations Team consists of one full time Crime Scene Investigator and several trained Crime Scene Specialists who are assigned to the Crime Scene Investigations Team as an auxillary assignment. Our full time Crime Scene Investigator is also assigned to the Forensic Evidence Laboratory of the Rocklin Police Department. The Crime Scene Investigator processes evidence for fingerprints, biological evidence and trace evidence, utilizing specialized equipment and various chemical processing techniques and technology. The Crime Scene Investigator is also specially trained in the examination and comparison of latent prints and is able to examine unknown prints utilizing the Automated Fingerprint Identification System. This system, coupled with the specialized training of the Crime Scene Investigator enables the development of leads in a variety of cases. The specialized training of forensic investigators combined with the collaboration efforts of patrol Officers, Detectives and outside agencies allows the Rocklin Police Department to solve cases involving known and unknown suspects and provide an exemplary level of service to our community.